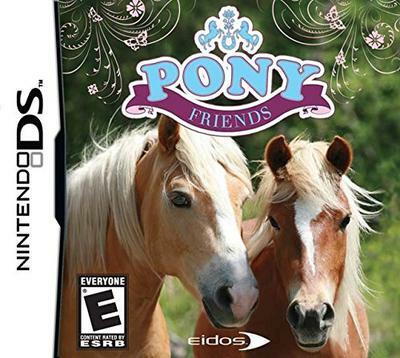 Pony Friends for DS is a really great game for all horse lovers! It's a great game overall! Yeah really it was a fantastic game. I have played this game many times. Especially it has a wonderful graphics. The graphics of this game was the important factor that has attracted me a lot. All of you can play this game easily and I am sure that you will like this game very much. Pretty cool! I love going on trail rides, i collected all of the animal pics! then you can't pay for meds. I don't really like it, I have it but i don't go on it often. This game has many kinds of horse breeds. You can also race with friends or alone and many adventures! Walk with your horse to the open area with friends or alone. Feed your horse well, clean your horse, go to the market and buy some things. Good luck! I look after a horse in real life and it is sort of the same. There are a few differences of course.. It's kind of like owning your own little stable and at first you will only be able to own one horse. You can have a maximum of three and the graphics are lovely! You cant take the saddle and bridle of which is annoying, you don't muck out as you would in real life. You wash your horse every day which can also be a little annoying. In reality your horse doesn't need a wash everyday. You can groom your horse just like a real one however, you pick it's hooves and brush it's mane, tail and coat. You can ride in different scenery and the graphics are beautiful, cannot emphasize that enough. The ponies look as realistic as possible and there are different colors, markings and breeds to buy, or you can create your own but that costs more. When you first have your pony you can take it for a ride at Mcvieties farm and you can take photos of animals to add to your photo book. You also find free pieces of tack or treats for your horse and if you come across a gate whilst riding if you click on it you can unlock new scenery. You can only walk or canter however when your riding but it's still fun. You can also compete in races by talking to your horse down the mic to encourage him to go faster! You earn more money everyday by completing your chores and also your given tasks to find things whilst out riding:-) of course when you have enough money you can buy a new horse,treats, tack etc! You can watch your horses in the field and make them perform tricks or come for a stroke. However they do walk away when they have had enough. Each horse has his own personality and favorite food! If you like games without a plot and a little free will then this is the one for you! Once you have unlocked everything it can get a little repetitive but you can always start over:-) It doesn't have a plot so younger players may find it more fun as it is a little simple. However older players will love it too! And it's great collecting photos, coins and other special things! Hope my review helped you all! pony friends isn't that bad. my friend let me borrowed it and i can't find stuff on the trails and almost everything cost 10 coins but on the other hand this game let's you ride your horse and you get to clean it, give it treats and accessories, the main and tail and change it's tack. You get to wash them, ride them, buy stuff for them, pick out their hoofs, take pictures, and lots more! I have had this game for like 3 years. I have all three horses and I am rich. I have ALMOST all the pictures you can get. It does get a little boring but I still like playing it. If you love horses/ponies you will like this game! I have owned this game for about 3 years. You can own up to three ponies. You can ride, brush, wash, and feed your own pony. You can choose from breeds or make your own. You are a photographer, so on your rides you are looking for stuff to take pictures. I absolutely love this game. Although I really want my ponies to have a foal. Does anybody know how? If so please please please tell me! I have pony friends 2. It is really fun. Not the best game I've ever played and would say Pony Friends 2 is better. this game is ace! you can get medals and stuff. I give this a rating of 5 stars! I wish I had that GAME it SOUNDS so so so COOOOL I really hope I can get it ;]. I think this game rocks! It has fantastic graphics. You get to choose from tons of breeds. Actually, I have the game Pony Friends 2. But its exactly like Pony Friends. First you browse through the breeds including Shetland Pony, Fallabella, British Spotted Pony, and American Miniature Pony or create your own special pony. Then name it, choose its gender, and birthdate. Then you can go to the stables and groom, wash, and pick its hooves. When in the field you can pet and feed your pony. And you can also buy tack and accessories for your pony. You con unlock trails to go on trail rides by gaining riding skill points. Feel like competing in races? Unlock thousands of races to choose from. Soon you and your horse will be the best of friends. Hope you love this game as much as I do. Have fun! this game's the best! i already got it now, waiting for mom to get no 2!